3. 7 groups ID code settable, User can use 7 groups individual wireless net without any interfere . 2. Press "Key" button to set same ID value of transmitter and receiver. Please use different ID value if you need use more than 1 group wireless universals at same time in same place. communicated frequency section. Green LED flash till received corrected same ID value, LED flash more fast once DMX data more fast. 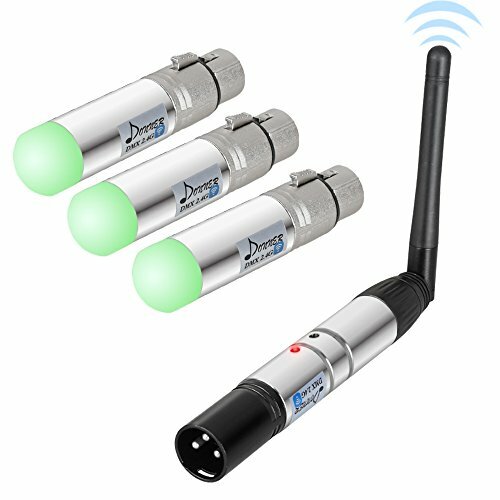 DMX512 wireless receiver/transmitter transmits standard DMX512 protocol data (generated by console) by wireless way. 126 channels jumping frequency automatically, high anti-jamming ability.